To My Friend John Sylvester, Just a few words reminding you that I have not forgotten my sick little pal. Sorry I couldn't get out to see you but here's hoping this little message of cheer finds you well on the road to recovery. I will try to knock you another homer maybe two today. Best regards from your friend and rooter, Babe Ruth. A man who knows he's making money for other people ought to get some of the profits he brings in. Don't make any difference if it's baseball or a bank or a vaudeville show. It's business, I tell you. There ain't no sentiment to it. Forget that stuff. Make no mistake about that. The old boy was the greatest player I ever saw or hope to see. When I was pitching I had fair success against all the other great hitters, but Cobb was one guy I never could get out. I had a reputation for being a slugger and I guess I could hit 'em pretty far at that, but that guy Cobb could do everything—better than any player I ever saw. Old Georgia Peach was a great hitter, a spectacular fielder, a wonderfui thrower and oh boy, how he could run. It was at St. Mary's that I met and learned to love the greatest man I've ever known. His name was Brother Matthias. He was the father I needed. He taught me to read and write — and he taught me the difference between right and wrong. 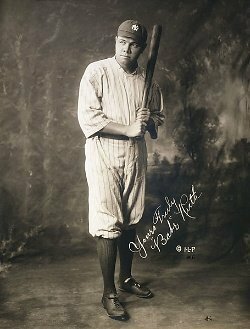 Bio: George Herman "Babe" Ruth, Jr. was an American professional baseball player whose career in Major League Baseball spanned 22 seasons, from 1914 through 1935.